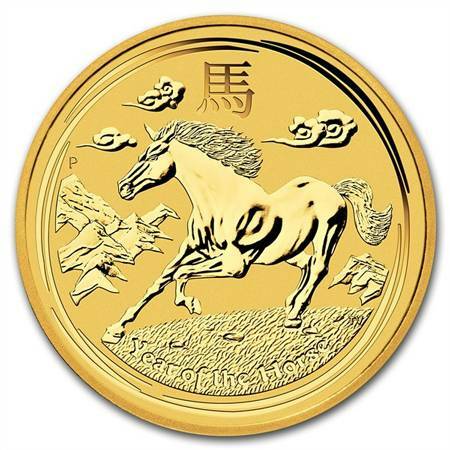 This 2014 2 oz Gold Lunar Year of The Horse Coin is an excellent choice for any precious metals portfolio. 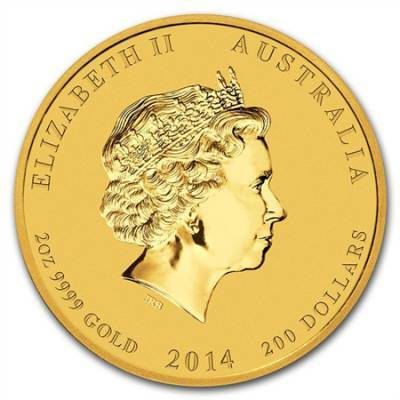 The coin is made from 0.9999 fine gold and comes in Brilliant Uncirculated Condition. The obverse features the profile portrait of Her Majesty Queen Elizabeth II. Inscriptions include "ELIZABETH II," "AUSTRALIA," along with the year of mintage, weight, purity, and the denomination. The reverse displays a horse galloping through the grass, with mountains in the background. Inscriptions include "Year of the Horse" along with the Chinese character for 'Horse' and Perth Mint's traditional 'P' mintmark. If you have any questions or concerns, please contact one of our customer representatives. With this purchase, you earn 2927 Bullionaire Bucks 2927 BB = $2.93. For every $1 spend, you will earn 1 Bullionaire Buck which is equivalent to $0.001 off a future purchase. 2927 BB = $2.93.